While I now write solely within these three areas, I certainly don’t blog ferociously, frequently or exclusively enough about any one topic to comfortably class myself as a member of these online communities. I have so much respect for those who attend five press nights a week, read and review eight plus books a month or dedicate all their free time and resource to travel writing, mostly alongside full-time employment. Absolute superheroes, honestly. But with all the things I throw at myself outside of my very busy working life, I just can’t prioritise the blogging game or developing an audience in the way that I often wish I could. What that does mean though – and this will lead tangibly onto the point of this post, I promise – is that I can make this platform as varied, nonsensical and even cathartic as I want. I don’t want to stop writing about theatre, books and travel, but why stick so rigidly to conventional reviewing? Why do I put off posting rambled thoughts or emotive reactions to things I’ve seen or read, just because they’re not written how they ‘should’ be written? When I opened my inbox to the chance to see Matilda, while being actively encouraged not to review, but instead to write on the topic of the #BeMoreMatilda campaign, it seemed like the first push in the direction I’ve been toying with for many months. There we go; it’s only taken four paragraphs to make my opening statement… here’s to many more rambled and far too self-indulgent posts. Isn’t that what blogging is all about? Cutting to the point: I adore Matilda. The book, the film, the character, and of course the musical. I first saw the show quite soon after it opened in the West End. Can we believe it’s been almost seven years? In fact, it’s been 30 years since the publication of Roald Dahl’s book, the metaphorical birth of Matilda herself. 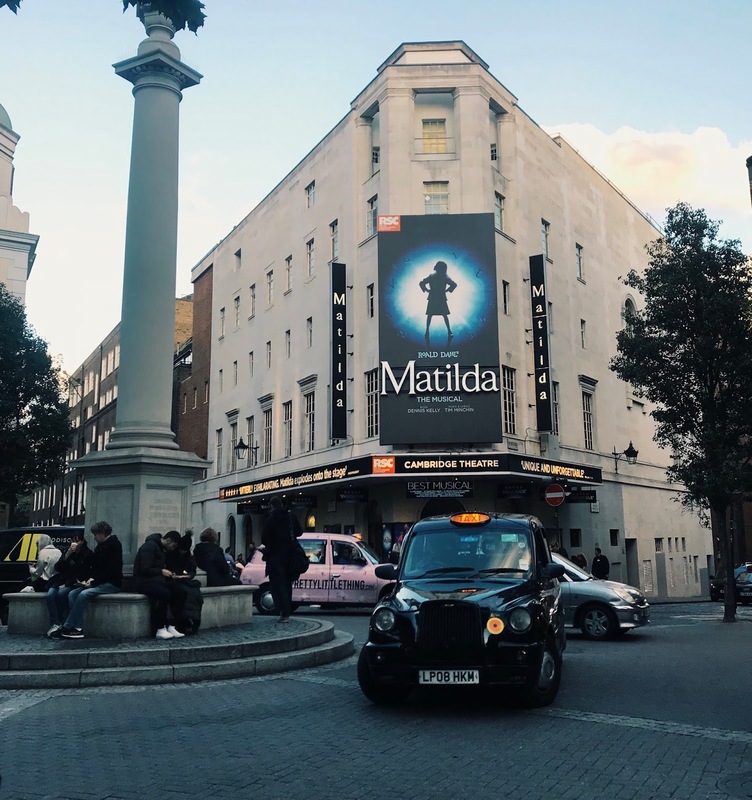 Matilda has journeyed through 17 million worldwide book sales, a well-known film directed by Danny DeVito, and now an award-winning stage musical with over 10 productions globally. And we still can’t get enough. What is it that makes Matilda such a timeless story? Why are we continually drawn to this character, affectionately transposing her into every medium? In my irrelevant opinion, it’s down to morality, mettle and magic; and not just because the alliteration makes for a super satisfying title. Morality is threaded through almost every children’s story, whether a prominent tie that holds the plot together, or subtly weaved into the narrative. What makes Matilda unique is her exceptionally perceptive ability to distinguish between right and wrong, while knowing that’s it’s not all about trying to smother evil with kindness, and that sometimes you have to be a little bit naughty. Though I’ve certainly never said the word 'mettle' out loud, and wouldn’t blame you for not even knowing what it means, it’s so fitting to Matilda. My trusty pal, Google, defines mettle as: a person's ability to cope well with difficulties; spirit and resilience. In its most literal sense, mettle is Matilda’s ability to cope with her insane family and challenging school days, but it is her spirit that continues to captivate readers, viewers and audiences alike. Matilda could easily be a tale of a kind, quiet girl who finds her happy ending and relief from her unloving family and bullish school teacher by living and breathing ‘goodness’ and not doing much else. Yet it is her fierce determination and unwavering will to take matters into her own hands that feed her understated charisma and ultimately lead to her happy ending. And this is no accident; Miss Honey is in fact the typical embodiment of kindness from the fairytale trope, and it isn’t until she embraces some of Matilda’s mettle that she gets the life deserves. While the musical version of Matilda emphasises magic less in the fantastical sense, it draws much more on the magic of storytelling and the power of imagination. Fantasy as a genre is hugely popular, of course, but the magic of Matilda is much more simple than that. It’s not her magical influence over inanimate objects that allures us back to this story over and over again, but instead those small but captivating moments of life that we can all relate to. The magic of an getting lost in a book, the magic of finding a friend, the magic between a group of people coming together to defeat a challenge, the magic of finally feeling at home. Am I getting too whimsical? Perhaps. I’ve touched on ‘quietness’ before on my blog and it’s something I’m keen to come back to in the future, so I won’t dwell on it too much, but it’s not a character trait that can be ignored and is a fitting conclusive point. The musical version of Matilda is seemingly more outspoken and less meek than her on-screen and literary counterparts, but she still an advocate of quietness. Besides her obvious bookish ways and comparatively low volume within her household, Matilda’s song, Quiet, is a wonderful expression of escapism from a chaotically noisy world and a sense of relief and relatability for those who also find comfort in retreating into the solace of their own mind. In a world that is so overwhelmingly loud, is it any surprise that we find comfort in this nostalgic, reassuring and magical tale? And in a life that often rewards loudness and egotism, it’s certainly reassuring to revisit a story in which quietness, kindness and selflessness are championed above those who can shout the loudest. Let’s all promise to #BeMoreMatilda. *I was gifted tickets in exchange for this content, but all words and opinions are my own.